As part of EUROCLIO’s project Teaching “Europe” to enhance EU cohesion, the project members have been contributing to a comparative research report that encompasses analysis of two history textbooks of each of the 28 EU member states, and specifically looks into fundamental commonalities and differences in European teaching about the European Union at the final years of compulsory education. The data generated by this analysis has been processed, clustered, and visualised by the EUROCLIO team. 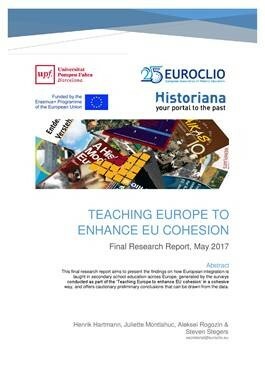 The condensed research presented in this research report and its preliminary conclusions aim to contribute to raising awareness on the importance of history education for young people and societies of the European Union as a whole, hence laying the foundation for establishing a roadmap for the institutional action to be taken in this field. The full report can be found as a downloadable pdf on the project website, or by clicking on the image below.